We took our name, Art Cut Gems, from the current optically-correct approach to precision gem cutting that breaks somewhat with traditional practices and sometimes yields new and exciting gem shapes. As cutters ourselves we know first hand what a huge visual and value difference such modern cutting makes. Our cuts, faceted or cabochon, are suitable for the finest traditional or contemporary designer art jewelry. The word “cut” may be the most misused and misunderstood term in the gem world. 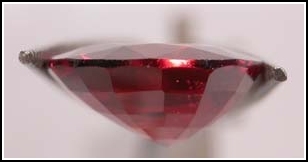 Some sellers use it as a synonym for “shape,” as in “oval cut” or “marquise cut.” But it really means attention to technical light-transmission aspects of a gem’s proportions and finish. It’s the cutter at the wheel who has the skill to turn a gem into the beautiful belle of the ball or leave it sitting ignored and lackluster on the sidelines. Our gems display many cuts and shapes that have become fashionable in the fairly recent past: opposed bar cuts, barions, checkerboard crowns, princess cuts and many others. Our emphasis is on proper, attractive fashioning of the most optically pleasing designs, new and traditional. We have created alliances with several cutting firms that allow us to deliver top precision custom quality at very affordable prices. So-called native cut stones, processed in some offshore locations, and sold on auction sites and in much U.S. commercial jewelry often have serious cutting defects. Many have substandard polishes and big “windows” (see below) and fat ‘bellies’ that only add unnecessary and costly weight. We avoid these stones and note the few we sell in our descriptions. Our pricing always takes cut quality into consideration. 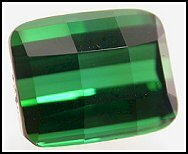 Good cutting makes the difference between brilliant, lively gems that reflect light and color back to the viewer’s eye, and lifeless stones with dull, unattractive windows you can read through like the example below. 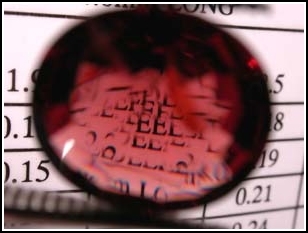 Among professionals these read-through stones are sarcastically called “Bangkok lens cuts” because that’s where most are cut and they’re more useful as reading lenses than reflective, beautiful gems. They are cut that way from thin rough that if cut properly would yield only small-diameter gems. The stone below is an example. The diameter is far too great for the depth, resulting in a lifeless, windowed, low value stone. That’s why such stones are also called “swindled” or “spread.” They deceive novice buyers into thinking they’re getting more than they actually are. Properly cut they would be smaller and less expensive. Without getting overly technical, light passes through various transparent gem crystals at different speeds resulting in different paths. Our experienced cutters know how to take advantage of those optical properties to cut at precisely the correct angles. They also know how to avoid muddy “off” colors, ugly black reflections, and many other problems. Finally a proper polish makes gems glisten with fine luster. Proper cutting actually begins with selecting the right rough stones. We obtain our rough gems mine-direct. 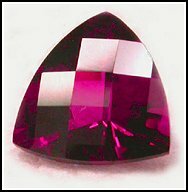 Considerable experience is required to know in advance just how various hues and tonalities in rough crystals will perform after cutting. This knowledge is especially important in selecting specific cuts for each rough. Some gems are cut for brilliance and ‘life;’ others for their unique and beautiful colors. Selecting just the right cut is critically important.